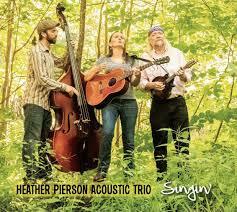 Heather Pierson joined WVUD’s The Music Room to talk about her musical history and her trio’s newest album Singin’. Her trio offers a variety of sounds such as blues, folk and jazz, while incorporating each member’s talents playing an array of instruments. Pierson raved about the importance of the love of music in her life and the influence it has on her songwriting and performing. Debuting in 2015 with their EP Still She Will Fly, The Heather Pierson Trio consists of Heather Pierson, Shawn Nadeau, and Davy Sturtevant. Shawn plays upright bass while Davy specializes in guitar, fiddle, dobro, mandolin and more. Their newest album, Singin’, displays the trio’s diverse abilities to play a variety of instruments and styles of music. They are touring the country offering intimate concerts at a multitude of venues.